We took an early morning train from the Prien station, near Bernau. Our first stop was Salzburg, Austria. The train then headed onward past idealic Alpine mountain villages in the Austrian Alps, along emerald green rivers and waterfalls, verdant meadows and other villages, some that were in the clouds. Truly quite spectacular. We both got a little sleepy but I tried to not shut my eyes not wanting to miss any of the grand scenery. At one point, a number of passengers got off. It was at Bad Hofgastein, which looked like a ski village (sans snow). We changed trains near the Slovenian border at Villach. We arrived in Lubljana in the pouring rain. Diane waited at a bus stop with our baggage while I checked a few places for rooms. They were booked. 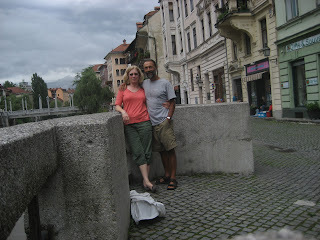 We ended up finding a nice youth hostel (H2Ostel) right along the Lubljanica River, very near the old city center. Lubljana sits on a site that has been inhabited since the Celts and the Romans. 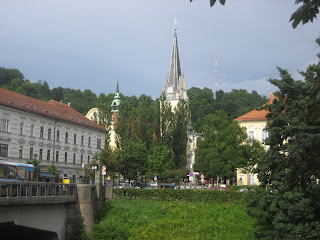 There are beautiful bridges along the Ljubljanica River. One of the bridges is the Triple Bridge, or Tromostovje, that consists of a main bridge and two parallel bridges originally intended for pedestrians. There's also the Shoemakers' Bridge that once was a gathering place for the city's cobblers. Very noticible is all the construction that's going on and the beautification projects. You really get the feel that this city is on the upswing in trying to attract tourists and their money. In the morning we took the funnicula up to the castle. It was a scenic ride up but the castle itself was not much since they mostly they are busy restoring it. There are lots of sidewalk cafes along the river, ice cream venodors, bars, restaurants and shops. We noticed that at 5-6pm, they are all pretty much empty. But by 8pm things start picking up. Here, people only start going out later in the evening, much like in Italy or Spain. 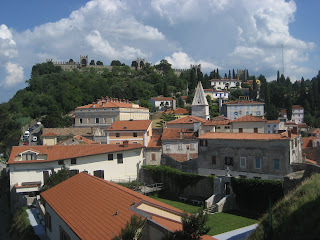 We booked a tour for Thursday to the Adriatic port town of Piran, which included a visit to a castle and a cave. Our tour guide was Sabina, a young Slovenian woman who spoke good English with an easy going personality. We were picked up with a large van - a total of five of us. Good group. Our first stop was the 700 year old Predjamski castle. 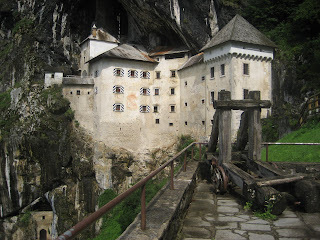 It is a dramatic castle shoe-horned into a limestone cave. The story goes that the man who built, Erasmus Leuger, stabbed a relative of the emperor. He then fled and along the way started robbing many of the wealthy. At that point, the emperor (one of the Habsburg's) got the governor of Trieste to have him arrested. It took a year to capture him because the castle was pretty secure. But the job was finally done when they were able to cannonball Erasmus as he was sitting on the toilet. As always, a servent had betrayed the master. 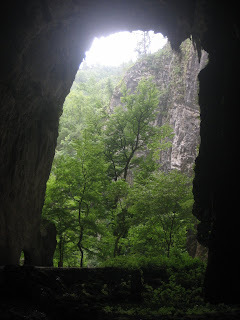 Our next stop was the Skocjanske Jame (Caves). After we started going into the cave, it looked like some of the others we had seen with the typical limestone columns of stalegtities and stalegmites. But after we entered the second large chamber we started hearing the roar of water. It was an underground river. At first we saw a bit of the river from afar. But a few minutes later, the roaring river in this cavernous space was fully evident. It was a Lord of the Rings setting. We walked on a bridge and looked nearly 500 feet below to the roaring river. Our guide told us that the river entered the cave just up ahead and went underground all the way through Croatia and part of Italy to dump into the Adriatic Sea about 75 miles from where we stood. After coming out of the cave, we had to walk quite a ways back up. But the views continued to be spectacular. It was an awesome experience, comparable to that of the Grand Canyon. On our way to Piran, our tour guide told us that the road we were on was once known as the Amber Road. It was built by the Romans almost 2000 years ago. Before that, this area was occupied by the Celtic tribes. Piran was a typical Italian or French quaint Mediteranean harbor town. Very charming. Diane and I walked all through the small cobble stone streets and ended up at the church of St. Georg, which had a panaromic view of the entire harbor area. After a bit more walking, we finished our tour at a local pub, sitting down with a glass of the local red wine, Refosk. Earlier on we had tried Terano, which is the same grape that's used to make the Refosk, but is grown in a red clay soil about 30 miles north east. The Refosk tasted a little fruitier with more body and structure, which may be because of the warmer climate. I did enjoy the Refosk more. Undoubtedly this will require more research. Tomorrow we're off to the town of Bled. It has a story book castle on an island in the middle of a lake. Stand-by.